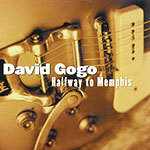 David Gogo's fourth album in three years sees him returning to his blues roots. Not as straightforward as "Change Of Pace", "Halfway to Memphis" sees Canada's premier blues guitarist turning his hand to other peoples songs while still managing to retain his originality. Opener 'Louisiana Blues' is rock with a blues twinge, all loud riffs and hoarse raw vocals. 'Click Clack' is solidly built over a Novaselic-style bass riff, while Gogo alternates between vocals and guitar. It's almost as if he is in competition with himself to see how many licks he can fit into one song. 'This is a man's world', originally by James Brown and Betty Newsome, is removed from everything it once was and rebuilt in to something distinctly new. This is music that demands attention and respect in an age of disposable pop covers. The original material on display is as strong as ever. 'Bad Faces' conjures up images of dank, dark, drinking holes where bad country hicks drink bad beer. One of the first songs ever written by David Gogo, a track called 'Soul Fever', makes an appearance here. It is mid-paced, blues-based rock that has weathered the passage of time well. I doubt there is another blues guitarist around at the moment who can speak through their instrument quite like David Gogo can. Modern blues at its best.